DONGHAE CITY, South Korea, August 16, 2010 (ENS) – South Korea’s government-mandated US$20 billion Four Major Rivers Restoration project rolls on despite massive opposition from provincial leaders, civic groups, the intellectual community, clergy, educators, and the media. 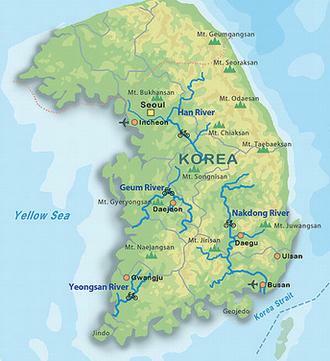 Planned to secure a steady supply of clean water, provide flood control, and develop regional recreation opportunities, the costliest engineering project in Korea’s history involves four rivers – the Nakdong River in the southeast; the Yeongsan River in the southwest, the Geum River in the west, and the Han River in the northwest. The “restoration,” which those opposed refer to as the “construction,” entails the building of 20 new dams, the raising of 87 existing dams, the raising and buttressing of hundreds of kilometers of river bank, and the dredging of almost 700 kilometers of river to a depth of six meters, according to the nonprofit Korean Federation for Environmental Movement. These numbers are all estimates, as the government and the opposition continue to play a game of cat and mouse with facts and figures since the project was announced in June 2009. Sunday’s Cabinet reshuffle showed President Lee Myung-bak’s determination to complete the controversial project as Environment Minister Lee Maa-nee and Land, Transport and Maritime Affairs Minister Chung Jong-hwan kept their posts. Minister Lee has been criticized for mishandling of the river project. One point of contention arose because the ministry’s environmental feasibility study for the project lasted just four months, while environmentalists say a year is needed to assess the environmental impacts. To smooth ruffled feathers, the government has embarked on a public relations campaign featuring glossy brochures, printed on post-consumer paper using soy-based inks, with color images of sailboats floating on reservoirs bordered by green zones and bike paths. Regional recreation will be enhanced through a network of 1,700 kilometers of bicycle trails constructed along these rivers. Plans to build numerous wastewater treatment facilities and remove area farms that pollute rivers will improve local river water quality, according to government sources. Cleaning the rivers, which have been suffering from pollution and industrialization for decades, will be akin “cleaning the arteries of a person suffering from arteriosclerosis,” say government spokesmen. What many people want to know, however, is how further industrialization can heal the wrongs of industrialization. Others, such as Yum Hyung-cheol and members of the Korean Federation for Environmental Movement have occupied a crane at the Ipo weir on the Han River since July, demanding that construction cease immediately. They have a generator and are camped out indefinitely. Detractors say that this huge project is little more than another piece of pork for the shrinking South Korean construction industry, which makes up an estimated 20 percent of the nation’s economy. But the government claims the project will provide 50 million cubic meters of drinking water and 90 million cubic meters of additional flood control area for this densely populated northeast Asian nation, which holds about 500 people per square kilometer, compared to a world average of 50 per square kilometer. To better understand the Four Rivers project, heavily marketed in Korean as “sah dae gang saligi,” or “save the four rivers,” one must look to the past. The Saemangeum Reclamation project, officially opened in April 2010 after almost 20 years of construction, several supreme court injunctions and much opposition and intergovernmental wrangling, involved constructing a 33 kilometer long seawall and expelling salt water from a biologically rich wetland six times the size of Manhattan, a reclamation project even bigger than Holland’s Zuider Zee reclamation. Today that land sits basically unchanged from a year ago, as government and business argue over what to do with the now dry, and mostly dead, tidal flat. The latest of several plans is to incorporate the land into Saemangeum Gunsan Free Economic Zone, a “mecca of low carbon and green growth” where people can “have various experiences in nature,” according to Lee Choon-hee, commissioner of the SGFEZ. 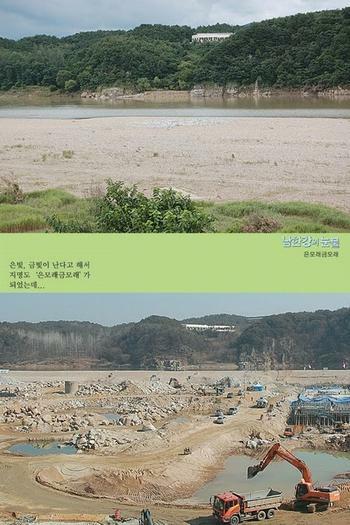 The original plan for the Saemangeum Reclamation project land was to convert it to rice fields, but now it looks like there will be a theme park, hotels, golf courses, condominiums, a convention center and lots of “low carbon” factories. Meanwhile, opposition to the Four Rivers project rolls on. The South Chungcheong and South Gyeongsang Provinces have each formed special committees to reexamine the project and propose alternatives. 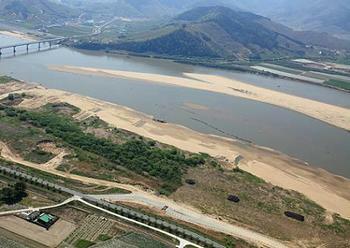 When several regional governors, including South Gyeongsang’s Kim Doo-kwan, decided to rethink the project and to postpone construction at several sites along the Nakdong River, they were told by central government officials to step aside so that the job could be finished. Government whistleblowers have lost their jobs and been threatened with fines. The fact of the matter is that a lot of earth has already been moved around, and a lot more will be moved around before the Four Rivers project is finished. A Japanese delegation that visited the site this July was “at a complete loss for words” as to the speed and scale of the construction. One observer remarked it appears that a canal is being built. Many people think a canal is indeed being built. President Lee rose to power on the 747 slogan, “7 percent growth and US$40,000/year income within 7 years.” But his dream for a “Grand Canal” linking Busan to Seoul was shouted down unanimously. Some believe that the Four Rivers project is a reincarnation of the grand canal project. To date, about 25 percent of the project has been completed, with a completion date sometime at the end of 2011, according to today’s “Chosun Ilbo,” Korea’s flagship news daily. The paper states that so far 500 million cubic meters of earth have been dredged from river bottoms. Visitors to several of the sites report former wetlands replaced by “huge mountains of sand,” punctuated with heavy earth-moving machinery and a steady traffic of dump-trucks. 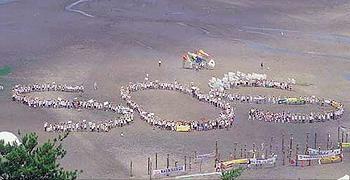 South Korea is a country that, due to its high population density, puts a tremendous stress on the environment. But those numbers are declining. South Korea has the lowest birthrate and one of the highest suicide rates of any country on Earth, trends that indicate the country’s future need for water resources will be less than today’s need. So, many people ask why the government is pouring all this concrete and securing all these so-called water resources, if the future population will be only half the size it is today.